Pattern Coloring specifies the patterns to be shown in color in the main edit window, and is very similar to Multi-Search. There are a few differences though - Pattern Coloring does not scan the file, nor does it show the found patterns in the Found Pane. 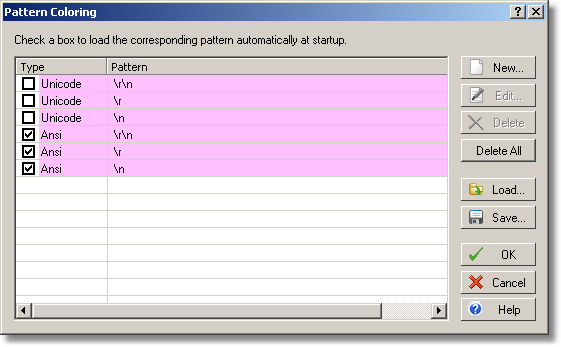 The checked pattern are persistent, and are loaded automatically on program startup. The example screenshot above will display all ANSI and UNICODE new line characters in the magenta color. The UNICODE group of patterns will be discarded on program exit, and the ANSI patterns are always available and don't need reloading. Pattern Coloring supports the Multi-Search pattern files; you can load a pattern file saved in the Multi-Search dialog and vise versa.